It is often assumed, and has been shown experimentally, that nonlinear operation of inertial sensors–in particular gyroscopes–can degrade or trivially improve performance. As such, the standard practice is to operate below or near the threshold where nonlinear effects become significant. The limitation with this method is that the dynamic range, or the range of excitations where the sensor behaves linearly, shrinks as the dimensions of the sensor decrease. Thus, while relatively large mechanical gyroscopes, such as hemispherical resonator gyroscopes (HRGs), can achieve navigation-grade performance, microelectromechanical system (MEMS) gyroscopes, being orders of magnitude smaller, have orders of magnitude worse performance. A relatively new class mechanical gyroscope, the frequency modulated (FM) gyroscope, is able to address long-term noise performance issues. The trade-off with FM gyroscopes, compared to the standard amplitude modulated ones, is that short-term noise can be elevated. One means of improving short-term gyroscope performance is improving short-term frequency stability. It has been shown theoretically and experimentally that while most states within the nonlinear regime of an oscillator degrade frequency stability, a select few allow operation at a lower fundamental limit. 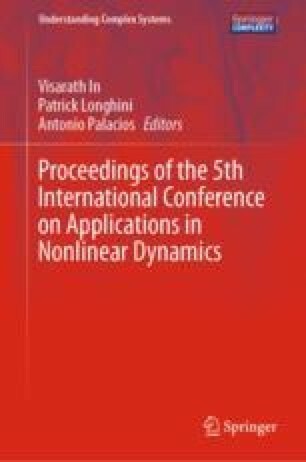 This work describes and provides some preliminary experimental work on the constructive exploitation of nonlinear operation with FM gyroscopes.